Have you ever been a caregiver or looked in on a neighbor or relative? Guardianship Corps could use your help! Become a volunteer care monitor for this newly-established not-for-profit. You will be assisting an older individual to lead the highest, viable independent living situation by visiting them twice a month and checking on their well-being. Then, following the visit, you write a paragraph or two and send it to the Guardianship Corps personnel. You are the “care monitor” and not the guardian; but you are the eyes and ears to the elder’s situation, whether they live at home or in a nursing facility. You are not responsible for the court proceedings or reporting, but you are the gentle first-line in assessing how well they appear to be doing. You will be making a really huge difference in the senior’s life! For more information on the opportunity, call Pegi at 631-979-9490 ext. 11. Each January, RSVP celebrates the memory of Dr. Martin Luther King by asking our volunteers to participate in a service project to honor his Legacy of Service. This year, we will be collecting much-needed, non-perishable food items. You may not know these facts, but at some point this year, approximately 273,000 people on Long Island will be affected by hunger and 39% of them are children. The elderly make up 4% of Long Island’s hungry. Seniors are among the hungry for many reasons. These can include not having enough income to afford nutritious food. We are trying to restock the food pantries of many outreach centers in Suffolk County. So we hope you will help us by contributing to our food drive. Items will be collected at our Smithtown office at 811 W. Jericho Turnpike, Suite 103W, from now until January 31st. 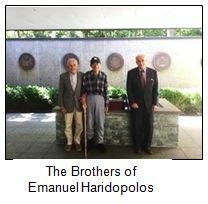 On July 7, 2018, my family and I were at the Calverton National Cemetery for the burial services for my Uncle Emanuel Haridopolos. The entire experience from my initial research to understand his eligibility to the day that we held his service at Calverton was exceptional. Everyone at Calverton National Cemetery was kind, caring and genuinely concerned for my family. They were compassionate and understanding as I went through the process. They helped me understand and submit information regarding his eligibility. They were there for me as I was thinking about his headstone, and they directed me to a Deacon and the VSO (Veteran Services Officer) who provided a live bugle player and gun salute at his ceremony. The staff at Calverton National Cemetery pledges to honor the dignity and memory of each veteran and provide excellent service to family and friends during a difficult time. They did that for my family, and they went above and beyond to help me each step of the way. The day of the ceremony could not have been more meaningful to my Uncle’s brothers but also to my 3 boys who saw how much honor and respect their uncle, grandfather and all of the veterans were treated with. If, in time of need, you feel your loved one may be eligible, please consider reaching out to the Calverton National Cemetery. On a personal note, the staff of RSVP is extremely happy and proud to recognize our very own Executive Director, Pegi Orsino. 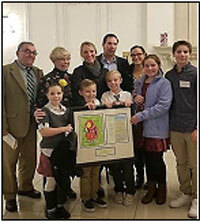 On November 8, 2018, Pegi was honored at Day Haven Adult Day Svcs.Neighborhood of Caring Breakfast. This award was given to Pegi for the 23 years she has dedicated her career to serving seniors in Suffolk County. Congratulations Pegi! You so richly deserve this prestigious award.